This signature line of 100 smooth and lush colours of Liquid Acrylics is a high performance paint for the professional artist. A true liquid acrylic in its purest format with an extremely high pigment and binder concentration. This extensive line is recognized for its versatility, vibrancy and range of colour selection. Due to the highest pigment concentration, using mediums is highly recommended to extend colours and to allow the paint to perform the way it is intended. 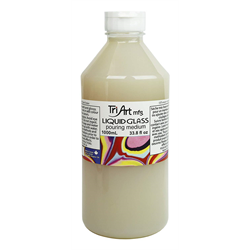 Liquid colours mix flawlessly with liquid mediums for thin, smooth layers or fine detail work. They are equally adaptable to being mixed with thicker gel mediums to create thick colours or textural effects. Once dry, the paint film will remain flexible and resistant to climatic changes. Liquid colours may also be thinned with water to obtain watercolour effects. All pigments have been selected for permanence, purity and lightfastness. No fillers or extenders are used. All colours are manufactured with 100% finest acrylic emulsion and pure pigments to reveal authentic pigment characteristics and colour chroma. The colour selection offers artists a choice selection of Opaque, Semi-Opaque and Transparent colours as well as matte, semi-gloss and gloss finishes. Use alla prima or mix with acrylic mediums to extend colours and create effects. Compatible with all other Tri-Art acrylic products.